We invite you to join us for an afternoon of premier golf and fellowship in support of the students of Notre Dame Catholic Schools. For over 150 years we have been providing an exceptional education wrapped in our Catholic faith to the children of our parishes and surrounding communities. Your participation will assist us in providing a quality education “FORE” our students! 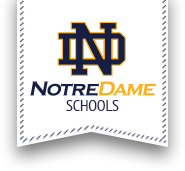 On Sunday, September 9th, members of the Notre Dame Community are invited to spend the afternoon with friends at Twin Ponds Golf & Country Club. Participants at this year’s tournament are invited to enjoy a day on the course. Lunch, dinner, and drinks are included, plus great door prizes. Questions: Please contact Olivia Tooley at otooley@syrdiocese.org, call 315.724.5118 for early registration or more information.